In this era of mass consumption, we are all drowning in 'stuff', despite our best efforts to keep on top of the clutter that collects in our homes, our office spaces and even our cars. All this clutter causes us mental anguish. However, as we all know, throwing things away can be difficult - it clashes with the values instilled in us from an early age of not wasting things, reusing items and keeping things 'for a rainy day'. Simply put, we feel guilty about getting rid of things. Enter Nagisa Tatsumi and her bold suggestion - that it's okay to throw stuff away. Most People Should Read This! The home you've always dreamed of is in your reach! Can you imagine what it would feel like to live in a home that is free from clutter, where every item not only brings you joy, but has its own place? A sanctuary where you can relax and escape from the stress of everyday life? 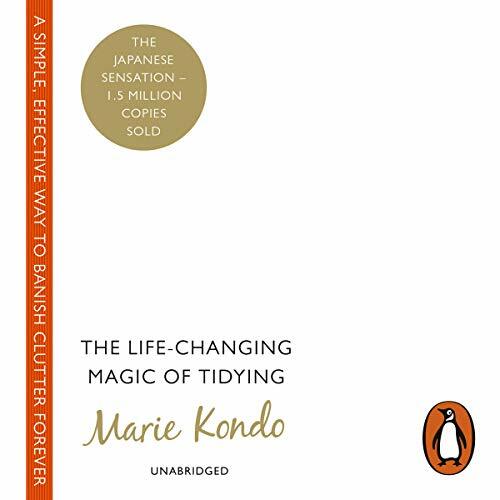 Made for those who find themselves drowning in clutter, The Life Changing Magic of Tidying Up by Marie Kondo is a must-listen. What makes this book special is that it delivers a whole new approach called the KonMari method when decluttering, arranging, and storing items at home. Author Marie Kondo is a Japanese cleaning expert who takes organizing and tidying seriously. amazing book. loved it. so mush fresh information. 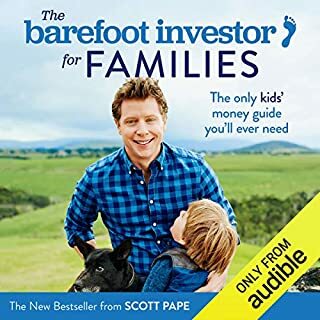 If, like me, you aren't a fan of the "fluff" that comes along with most books and would much rather skip to the nuggets of wisdom and actionable content in a very easily absorbed and easy-listening way including key takeaways, then I believe this audio summary is for you. The key to successful tidying is to tackle your home in the correct order, to keep only the things you really love and to do it all at once - and quickly. After that for the rest of your life you need only to choose what to keep and what to discard. The KonMari Method will not just transform your space. Once you have your house in order, you will find that your whole life will change. You can feel more confident, you can become more successful, and you can have the energy and motivation to create the life you want. You will also have the courage to move on from the negative aspects of your life: you can recognise and finish a bad relationship; you can stop feeling anxious; you can finally lose weight. Marie Kondo's method is based on a 'once cleaned, never messy again' approach. 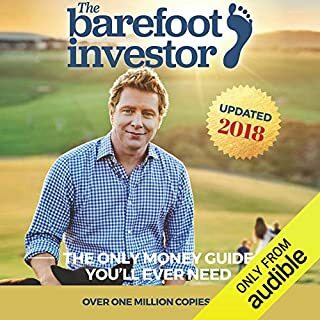 If you think that such a thing is impossible, then you should definitely listen to this compelling audiobook. Loved it. The narrator was lovely and very pleasant to listen to. I feel inspired about beginning my journey. Almost made it to the end. Became too much when items of clothing were given emotions and feelings. After a lot of praise from others I gave this a listen and found it painfully basic. It continuously plagued on and on of rather cliche terms. I'm not certain what I intended to find in this book but I was left very unimpressed. A delightful audiobook, excellently narrated. I really enjoyed it and have begun implementing the Konmarie method. Quite cute how she gives inanimate objects a personality and really believes they have feelings and respond. A bit too much for this realist to deal with in some parts but it did illicit the odd smile which made up for it. Great advice regarding the approach to getting your house in order. I think I’ll be using the term ‘spark joy’ forever. 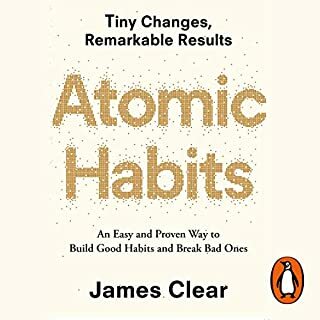 More than just a wacky Japanese neat freak, Kondo describes a clear and thoroughly researched method for bringing order (and thus peace, well being and even personal growth) into one's life with humourous anecdotes and humble wisdom. This was an interesting read, some out there ideas but a lot of it made sense. I am currently putting her ideas and recommendations into use, so far so god! 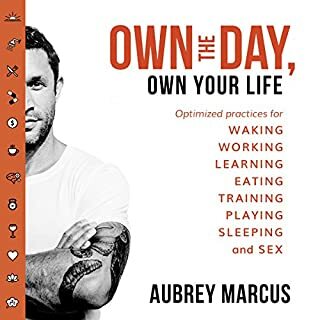 this book was interesting to listen to. 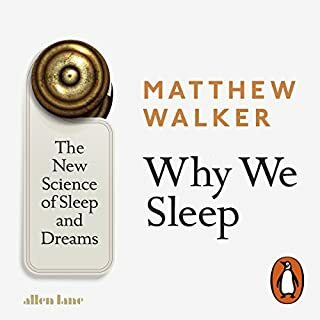 I very much enjoyed the first few chapters though as it went on it got more and more kooky as far as what the author believes about inanimate objects. I'm an open minded person to a point but I definitely cannot bring myself to believe that my socks have feelings. however, I was able to take from it many good points, and I also connected her interesting view on things, to my own belief that we should appreciate everything we have and treat our items with respect. the information on actual tidying itself, was very good. 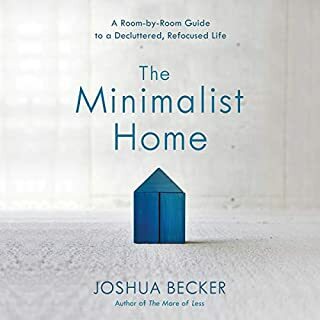 even if you think you might disagree with her almost spiritual approach towards non-living things, I'd still recommend.it,it's worth reading this book for the great perspective on how to get your house in order. I still got a lot out of the book. the narrator was great, easy to listen to, even relaxing. I totally enjoyed this book and would highly recommend it. The readers voice was easy to listen to. The ideas were clearly explained. I have to admit that some of Marie's ideas made me laugh or roll my eyes but she makes a good case for them and they are quite different to anything else I've read about decluttering and organising so I'm willing to give them a try. 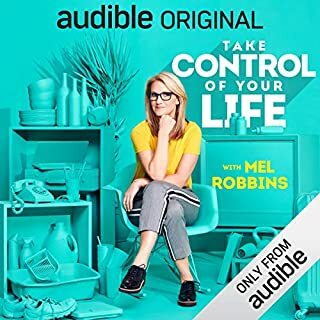 The book was actually a delight to listen to, Marie's unique, eccentric & fun personality shine through along with the great practical advice. Good book. Message is clear, but how one should clear should be very individual. It is quite a general view in the sense it cannot be applied by everyone. If one is living alone than it maybe fine, but if one lives with family or extended family, than it may not be ideal. Therefore it comes down to ones own discovery or path. I did benefit from reading the book. 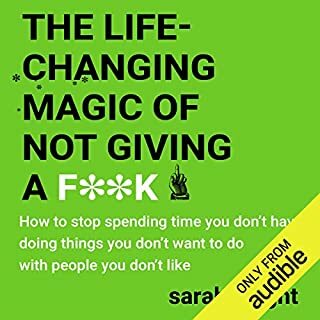 I would recommend this book to a friend who has too many things and too little "life". 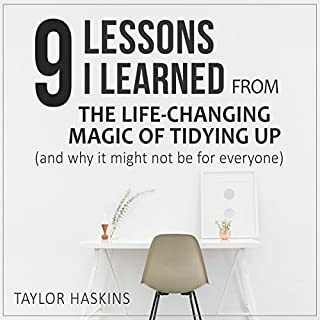 The author is telling about "the life-changing magic of tidying up" and I feel like almost every adult needs to know more about it. It was definitely the book I wanted to listen in one sitting as I wanted to follow all the advises as soon as possible! Easily applicable tips to live more mindfully and happily. Very recommended book for all ages. I was looking forward to the hyped "domestic wisdom" of the book. I was however, disappointed after the first chapter. While the book starts you off with a very motivational chapter, it gets very repetitive and pushy right after that. I had to power through to finish the book infact because the material was beginning to sound so stretched out and unnecessarily lengthened. 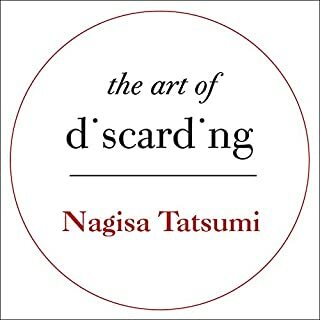 The narrator did an amazing job in every aspect, but the material *of* the book was intolerable due to the amount of boasting and self-assertion that was overbearingly repeated over and over again. All in all, I walked away with just two benefits: motivation to complete a decluttering process I had already started and a new way to fold and arrange clothes in drawers which I find to be aesthetically pleasing. 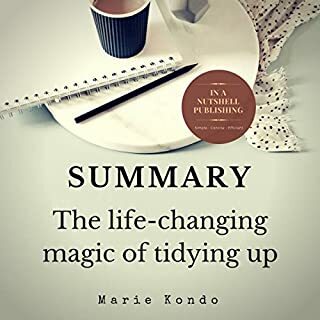 If you wish to take tips and pointers, I would recommend one of the summaries available on Audible or hopping onto youtube for a quick search on decluttering the Marie Kondo way. You will get everything you need to know from either minus the boring stories, insufferable reptitiveness, and bragging. I heard of this book for about two years ago, when I finally decided to read it now. And since I am impatient, by now I really mean now. So when I saw there is no ebook available for my location, I downloaded audible and listened to it here. It was great! Better than I expected it to be! 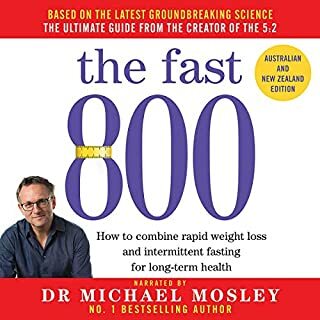 From the contents of the book to the excellent narrating, I enjoyed every second and finished this book in one sitting - or should I not use the word sitting, since I was able to do the things I wanted to while listening? How convenient! And, if you're wondering wether you should read this book or not I strongly recommended you to. Even if you know what the book or the konmari method is about, you WILL gain more from reading it. I promise! I think this could have been shorter, then I again I understand the importance of emphasising certain points multiple times. I do believe it could be life-changing to implement this. Would have got 5 stars had it not had too much spiritual nonsense (not that I'm not spiritual, but this takes it too far, claiming silly things as facts). 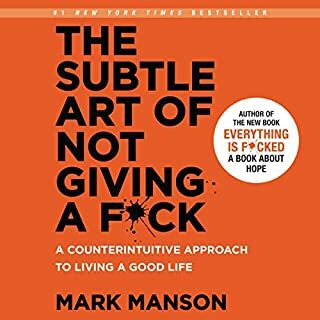 I think it's a unique book and most people should read it. I like to listen to her personal travels to become the tidying goddess. I perfected spark joy if I have to choose. I enjoyed the content as much as i could but it has errors inside so some of the words get swallowed during reading. Great, easy to listen and to follow. Provides interesting insights and thinking processes. I recommend! 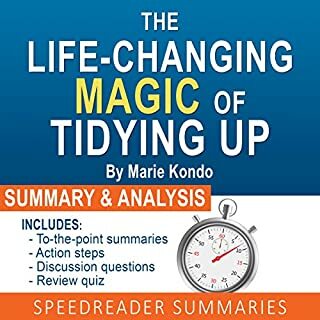 Would you consider the audio edition of The Life-Changing Magic of Tidying to be better than the print version? 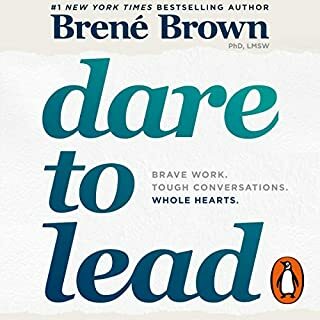 Bought the book weeks ago but it took me getting it on Audible to get me started. Finished it in two days and have since filled my car with old clothes and books - home already looks and feels better - looking forward to carrying on decluttering tomorrow. Don't hesitate to buy this book. I feel so much lighter after putting my life in order. Definitely one of the most important books I've read to date. There is also an app that helps take you through the entire process. Good luck! How wonderful to now have Marie Kondo on audible. It enables a refresh for my memory at any time. This makes me happy as does being tidy. Good tips on how to focus on genuinely clearing clutter and reassessing the value and sentiment we place on so many things we feel we can't part with, but are ultimately deadweight to our lives and homes. I disliked the use of 'throw it away' that she stressed so much - please recycle and drop off at charity shops as and where you can!! It's also originally a Japanese book so has some text specific to them but not too much. I've already started to Marie Kondo my house so it must've sparked something!!! If you were interested in the book you will love it! 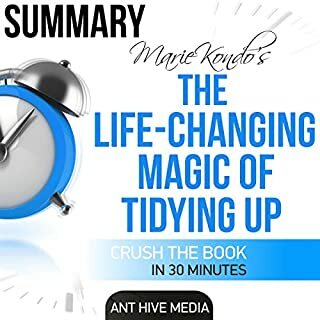 If like me you have heard of the Kon Marie method of tidying and getting your house in order, then you will really enjoy this book. 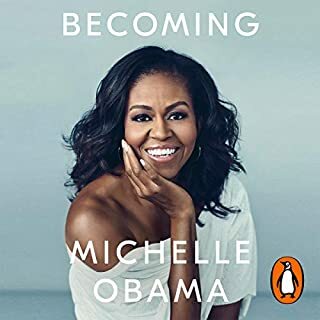 Of course the author has become world famous and some of the methods may seem a little strange, but I certainly loved every minute of this beautifully narrated book. Interesting but not sure it’s life changing! This is a very interesting book, especially for someone absolutely rubbish at tidying up. The narrator has a calm soothing voice that feels slightly like a form of meditation or brain washing however it hasn’t provided me with a huge enthusiasm for arranging my life. 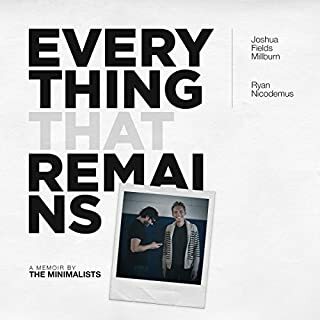 It has however given me ideas for being more methodical and a better ability to prioritise with this books concept of objects that do or do not bring joy. It’s an easy listen with lots of interesting stories and case studies throughout. One word: incredible. If you want your home environment to be immaculate then listen to this book NOW! Marie's passionate words are informative and provide a great outlook on living. These 4 hours have truly taught me to live in the present, extinguish my day-to-day fears and be appreciative of what I have. What a quirky author! Lovely content. purchased it on Sunday morning, before getting half way through the book I had gotten rid of 70% of my clothes, she is THAT persuasive! I put them into large bags and dropped them off at the charity store before I'd even finished the book. Now for the make up and books to rummage through! Lovely stories, great content and tips. Soothing narration. Just what I needed. I purchased this book as it's sparked my curiosity as I am always tidying and was hoping for a miracle. I started applying the methods detailed in the book to organise my home whilst still reading the book and was pleasantly surprised to how it made me feel about my possessions. The book is well laid out, easy to follow and I would recommend to anyone who wants to declutter their home. The author takes you through the process in small stages and it is actually enjoyable!